This semi-steamed rice dish is sweetened in the traditional way with dried dates. Cooking the rice without removing the lid or stirring gives a light, fluffy result. Melt the butter in a large, heavy-based saucepan with a tight-fitting lid over a high heat. Add the onion and cook for 5 minutes or until golden. Add the garlic and cinnamon and cook for a further minute, stirring continuously. Pour the rice into the pan and mix well to combine. Add the hot stock and cover. Bring to the boil then reduce the heat and simmer without stirring for 10 minutes, or until the liquid has been absorbed. 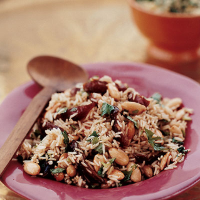 Add the dates, coriander and almonds to the hot rice. Season generously, stir and serve hot, with Greek yogurt. For best results, pre-cook the onion mixture and allow to cool before taking to the party. Keep covered in the fridge then reheat thoroughly before continuing. The finished pilaff can also be reheated. Microwave on full power, stirring occasionally, for 3-4 minutes until heated through, or cover with buttered foil and heat in a preheated oven at 180°C, gas mark 4, until the pilaff is hot.